Strolling casually off the coach sporting a questionable piece of headwear accompanied by an outsize pair of Bose headphones appears the look du jour of your average Premier League footballer. Fashionistas would say the look is effortlessly cool, the epitome of the modern professional sportsman who prefers the latest downloads to an inspirational speech from the manager. 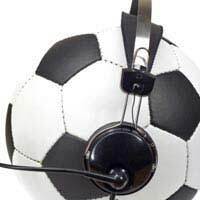 Thankfully the Premier League glitterati haven’t yet extended the playing time of their MP3s to when the whistle goes - for one thing they wouldn’t hear it. Drum and bass or Hip Hop tracks wouldn’t do much for their concentration, either. The same is true of the amateur sportsman and woman, too. The fact of the matter is that music and sport just don’t mix. Even now, the protestations of millions of running enthusiasts can be heard: music helps pass the time; it’s a welcome distraction from the aches and pains, mental or physical; it is a great motivator when the rain is beating down or that difficult uphill stretch is approaching. All true to an extent. But what about the fact that music blocks one of the senses potentially needed for survival when running on the road or pavements. Can a runner wearing ‘phones, for example, hear the driver sounding his horn to warn he is manoeuvring into the side road they are about to cross over? What about the runner who hasn’t noticed the lights at the junction they are negotiating have turned from red to green because their attention was on skipping a couple of tracks?Ideally, the two senses should be working in tandem, but even if a runner’s eyes are momentarily distracted, the ability to hear clearly can compensate. The same applies to cyclists. Anyone who regularly manoeuvres through city traffic will testify to the fact that you need your wits about you. Ah, some will say, but motorists listen to music. Very true, but if there is an impact between a car and a bike, irrespective of whether one or both individuals have their tunes on, guess who is going to come off worse? And what about the safety of pedestrians who may be crossing a side road, or a child who fully expects the cyclist to have noticed their presence near a footpath? A jogger impacting with another pedestrian can be nasty, but a cyclist is travelling at around three times the speed, and the consequences can be a great deal worse – for both individuals concerned. There is nothing in the law that prohibits cyclists or runners from wearing headphones, and there is no suggestion that the vast majority don’t exhibit anything less than due care and attention when interacting with other members of the public, whether on foot or on two wheels.Nevertheless, in the interests of everybody’s safety, it is worth considering leaving the ’phones in the house next time you grab the running shoes, or wheel out your machine. You may find that the absence of music in your ears promotes greater relaxation and enhanced performance, too. There are one or two overpaid Premier League stars who could learn a thing or two about that.